Last weekend saw the last of the Club Competition Finals. Some great bowling with most games going to the last end. Results were: Irene Ward Singles Trophy, Eileen McLaren beat Janet Thomas; David Bentley Singles Trophy, Gary Raby beat Alan Booth: Harry Faulkner Singles, Gary Raby beat Stan North; Ladies Drawn Pairs, Margaret Patterson & Gail Willshire beat Carol Rudge & Ann Eagle; Gents Drawn Pairs Allan Patterson & Bill Brownlee beat Brian Miller & Len Rudge; Ladies 2 Wood Singles, Gail Willshire beat Ros Stockell; Gents 2 Wood Singles, Bob Nesbitt beat Reg Cooper. Congratulations to the winners and well done to all who reached the finals. 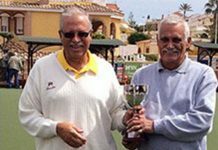 The Presentation Evening will take place at El Prado on Tuesday 25th April. See notice board for menu or Janet Thomas for details. 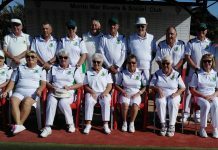 The Winter League were away at Bonalba winning 10-2. The losing team only lost by 1 point!! The Berleen also won. Well done all. Fridays game against Emerald Isle had 2 winning rinks, giving a 4points to 8 result. Well done to Carol Rudge, Don Whitney, Dave & Lyn Greenland 18-16: Cliff Plaisted, Val & Chris Collier, Stuart Denholm 17-14. Shots for 70 – against 104. REMEMBER THE AGM on THURSDAY 6TH APRIL 0930 FOR 1000 START. THERE WILL BE NO BOWLING UNTIL THE AGM FINISHES. WASPS on Wednesdays at 1.30. 5 euro’s for an afternoons bowling, you can borrow woods and shoes for free, with free tuition if required. Bowlers of all abilities welcome. No dress code. 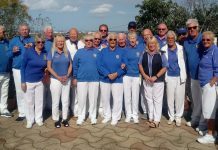 For further information on San Miguel Bowls Club please contact the President Eileen Potts telephone 966730376 or Secretary Pat McEwan, telephone 966714257. 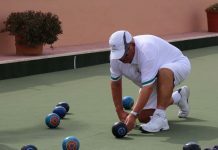 SAN LUIS BOWLS CLUB REPORT 31.03.17. 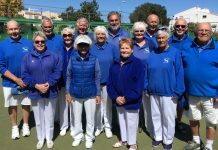 We are about to begin the South Alicante Summer League season on 7th but there is still the matter of the Winter League to complete, with 2 matches this week. 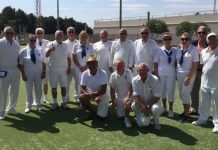 Wednesday 29th Winter League home to Javea Green; there was some excellent bowling in a really close fought game. Ultimately we managed to win 2 rinks and hung on to win the overall shots 77-76 for 6 points -6. Winners: Lynne Morris, Jo Pering, June & Keith Jones 17-15, Irene Everett, Vic Slater, Peter McEneany, Tom Hill 21-9. 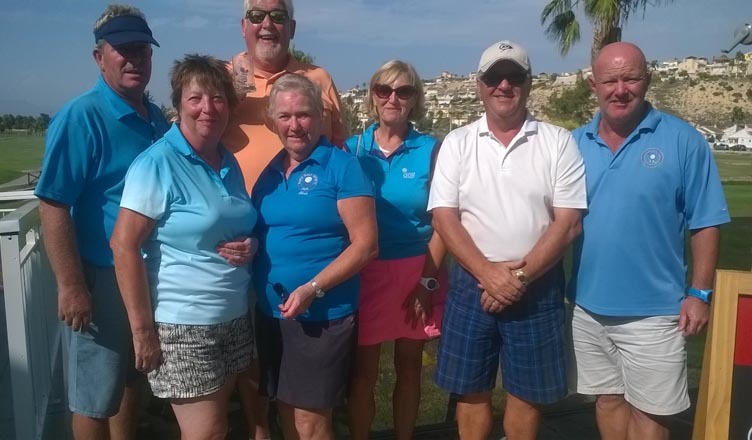 The Berleen team of Margaret Morrison, Pam Lockett, Charlie Marigold, Barry Edwards had a great win 25-11. The second Winter League match of the week on Friday 31st was home against our near neighbours; La Siesta. After a cloudy start it turned out to be a good morning all round; warm, sunny and a great result 10pts-2, shots 95-62. Winners: Lynne Morris, Jo Pering, June & Keith Jones 18-9, Shirley Verity, Ray Clarke, Jules Pering, Russell Marks 19-16, Ann Holland, Keith Phillips, Sabrina Marks, Mal Hughes 29-7, Kath Reid, Sheila Cammack, Neil Morrison, Scott Malden 22-8. No Berleen team match. With 2 matches to go, this result has kept us in 1st place, on equal points with Vistabella but ahead on shot difference, so the fight is still on! On Monday 27th we had the great pleasure of hosting another touring team; Barwell IBC. It was a friendly game, with good company enjoyed by the players. Although immaterial, San Luis won 4 games -3. Following our AGM on 30th March, we have a new committee. Membership Sec. – Ros Holmes, Social Sec. – Doug Beattie. 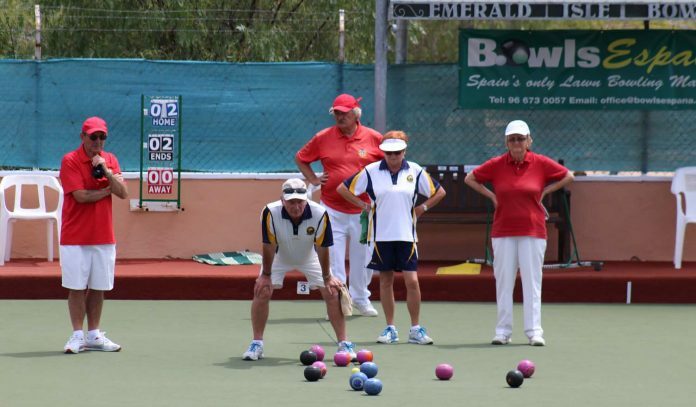 The “Avalon Insurance” sponsored Mixed Triples Competition will run: 14th – 16th April at San Luis. Sue Cooper is now accepting entries for the 4-2-2 competition, 8th -10th October. Two Winter League matches this week and two different results especially for the two Barry’s. On Wednesday we travelled up the motorway to Finca Guila where some of us met old friends and some made new ones. We won by three rinks to two with Colin Armitage, Mike Stone, Mo Kidd and Lynn Armitage winning 17-14. Then there were the Hadaways who both won. Shirley’s four were the winners by 28-14 and she was helped by Phil Pape, Alex Whyte and Ann Stone while the girls once again carried their Captain and leader Dave to the fine score of 25-8. So well done Jean Perchard, Barbara Forshaw and Janet Parsons. Now come the two Barry’s both claiming they won the extra two points on the last end to give us the overall shots and an 8-4 win. Both rinks got “stuffed “ but Barry Sadler, Peter Parsons, Mike Smith and Margaret Sadler claim their three shots on the last end won it while Barry Latham, Terry Perchard, Wendy Latham and Carol Smith say that cutting down the three against to one on their last end was the winner. As I am writing this you might guess we did it. So on to Friday when the League Leaders Vistabella came, we were hoping to do the same to them as we did to Quesada but it was not to be. They won on three rinks plus the overall shots but by only eight. They won 8-4. The shining lights were the two Barry’s and, of course, their fellow bowlers. 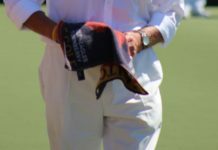 Barry Sadler, Peter Parsons, Margaret Sadler and Mo Taylor won 21-19 and the Scribe won 17-8 with help from Dave Taylor who had a great game plus Wendy Latham and Kathy Manning. Another little argument was did the number of wrong biases mess our shot difference up. Unfortunately nobody wanted to tell me who the miscreants were. Once again the Berleen lead by Alex Whyte with Jim Freeman, Angie Butler and Martin Butler had a fine 21-12 win. Winning on two rinks well done to Geraldine Fisher, Ronnie Cairns, Dave Melville and skip Gordon Fisher. Sue Kemp, Jan Gatward, Danny King and skip Gordon Fisher. Shots Monte Mar 85 – 92 Bonalba. Points Monte Mar 4 – 8 Bonalba. Our annual competition of Captain’s team (Ronnie Cairns) vs Chairman’s team (Chris Harding) took place on Sunday 26th March. 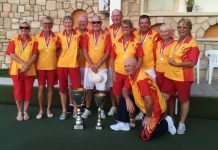 The Captain’s team won the trophy this year, the highest scoring team of Jan Soars, Jan Gatward and Brian Zelin also received medals. After the game everyone sat and enjoyed a drink plus an excellent buffet which was provided by the club and prepared by Liz Melville, Babs Farrelly and their helpers Val Hyman and Audrey King. Well done ladies. Winning on two rinks well done to Sheila Roberts, Howie Williams, Harry Dobson and skip Bill Young. Sue Kemp, Jan gatward, Danny King and skip Brian Zelin. Shots Monte Mar 75 – 95 El Cid. Points Monte Mar 4 – 8 El Cid. 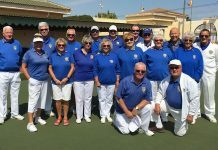 In the Winter league on 22nd March we were at home to La Siesta.After a very competitive game played with good humour and sportsmanship the final scores on the doors were – total shots for – 96. Against – 81. Points for – 8. Against 4. Winning rinks —- Margaret Dewar, Jean Giddings, John O brien, Marilyn Fryatt. – 21 to 17. Sandra Jones, Doreen Watt, Dave Thompson, Graham Watt – 17 – 8. Sheila Stead, Jean Thompson, Kim Hunter, Mel Brown – 32 – 12. 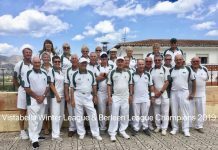 On the 29th March in the Winter League we made the long trek up north to El Cid Bowls club. Final scores after a very close game were as follows…………Total shots for – 81. against – 87. Points for – 4. against – 8. Winning rinks were – Margaret Dewar, Jean Giddings, John OBrien, skip Sue Brown. – 15 shots to 14. Sheila Stead, Jean Thompson, Val Duchart, Skip Mike Kelly. – 17 shots to 13. On Friday a re-arranged winter league match against Quesada was played at home and proved to be a very tight game. So after a very competitive game played in the right spirit the final results were as follows……………. Total Shots For – 79. Against – 102. Points for – 2. Against – 10. Winning rink was – Sheila Stead, Jean Thompson, Kim Hunter, skip Mike Kelly. – 22 shots to 15. Well played everyone. 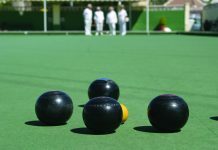 Greenlands Bowls Club would love to welcome new bowlers to the club and to facilitate that on Saturday mornings we have a fun morning of bowls where people new to the game can participate in a relaxed and friendly atmosphere with prizes on offer. Please Telephone Haley on 966844399 for all enquiries. Previous articleVISTABELLA OPEN TRIPLES COMPETITION. WITH LYNNE BISHOP. Next articleTHE LEADER TIPS 20-1 WINNER BRAVERY IN LINCOLN BIG RACE WIN!